I don’t know whether it’s the gloomy weather or what, but I so haven’t been in the mood to take pictures of this project. It’s been finished since November 18 and I only (begrudgingly) took the pictures yesterday. I usually prefer taking pictures of my creations before I wear them for the first time because I’m afraid I’m going to ruin them and not get a chance to capture them for eternity or something, but this one has already gotten its fair share of wear before getting photographed. See how the sleeves creep up? 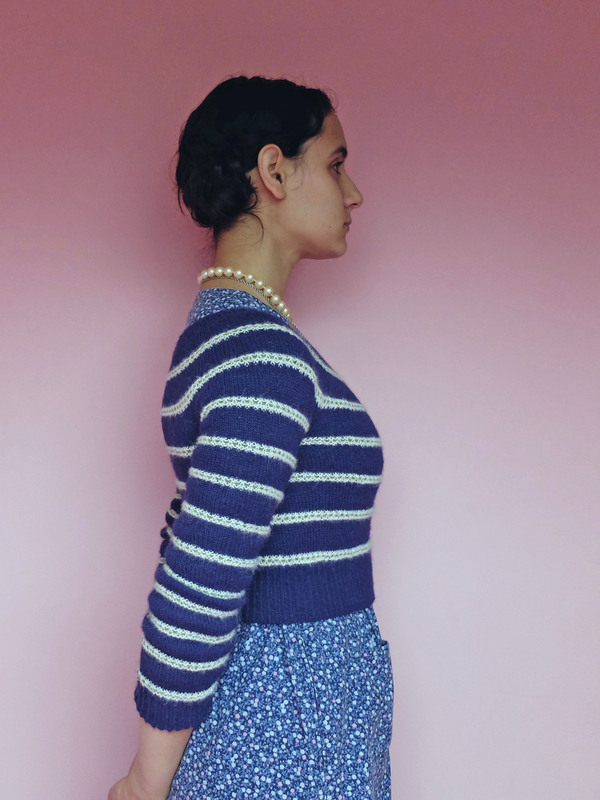 The pattern is Coronis by Emily Ringelman, from Pom Pom Quarterly #10 (best magazine name ever by the way) and it was really easy to follow yet pretty interesting to knit. You can take a look at my Ravelry notes for more technical details. 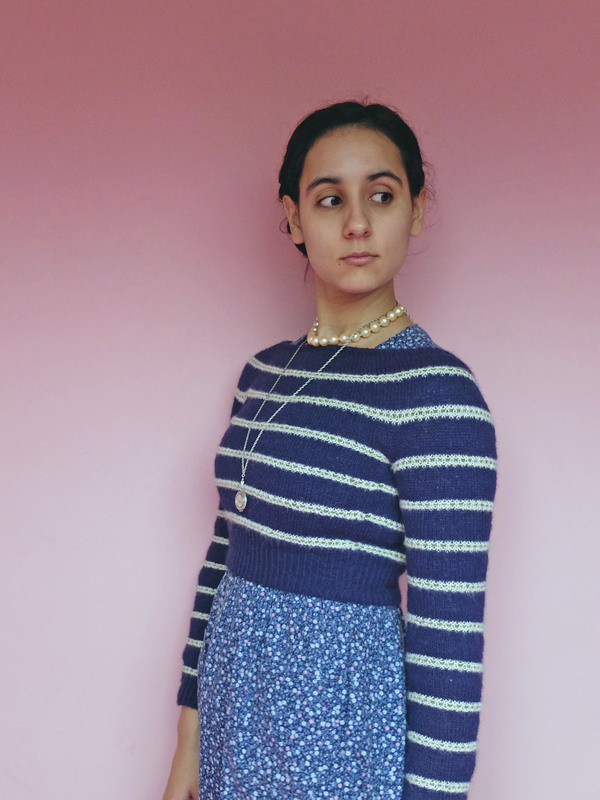 From afar it looks like yet another navy/white striped sweater, but there’s a twist! Look at this detail picture: These stripes may look complicated, but they aren’t at all. You only work one colour per row, and the pattern is really easy both to understand and to memorise. The wool is Drops Alpaca, which I loved working with and love wearing. I already have another project in my queue using this same yarn. 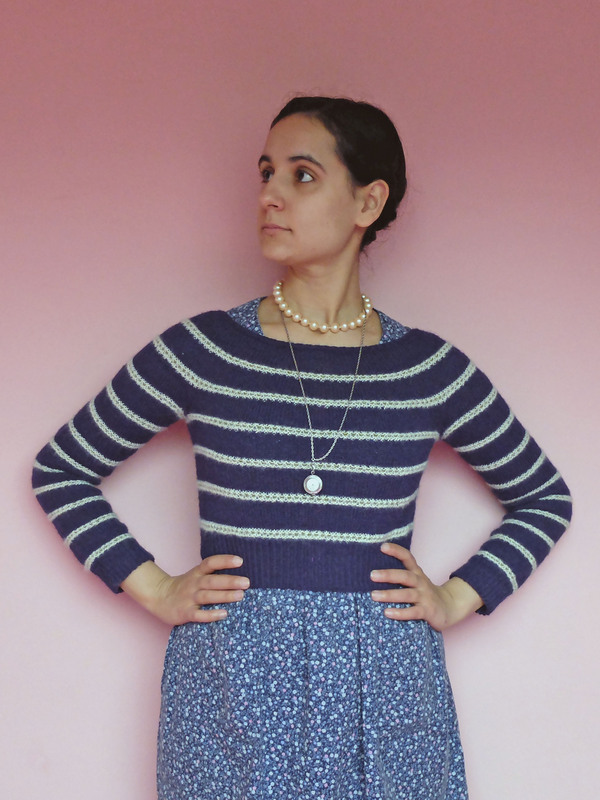 I completely messed up the gauge on this sweater: I suddenly decided my gauge (which I had checked beforehand) was too loose, so I unravelled what I had already knit and started over with smaller needles. I still don’t know what possessed me: when have I ever knit loosely? The answer is NEVER! I’m a tight knitter, have always been and will always be! It’s a good thing I had decided to knit this sweater with positive ease for once and ended up with a sweater with negative ease, instead of a too tight sweater as I would have if I had decided on a sweater with negative ease, which is usually my preference for that kind of cropped sweaters. 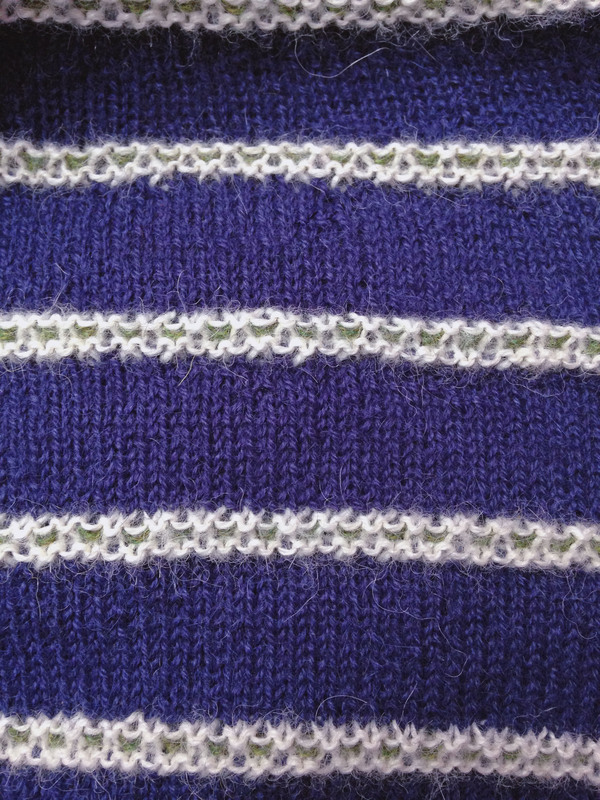 Because of that impromptu change of needles, I had to knit way more rows to get the length I wanted, so I ended up with more stripes than on the original. And I’ll have even more rows and even more stripes when I add some length to the sleeves and body. But I guess having too many stripes is not the worst flaw a sweater can have, so once I get to lengthening it I won’t have anything negative to say about it anymore! 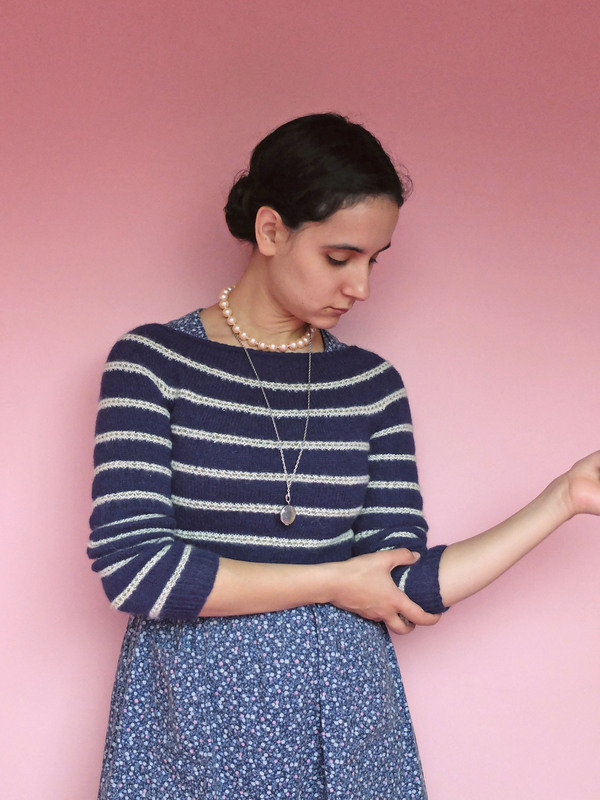 I really like the style and the fit and I think it will look very cute with quite a few of my dresses and skirts! Very cut! I definitely need some more shorter length jumpers in my wardrobe and you can’t beat a stripe! 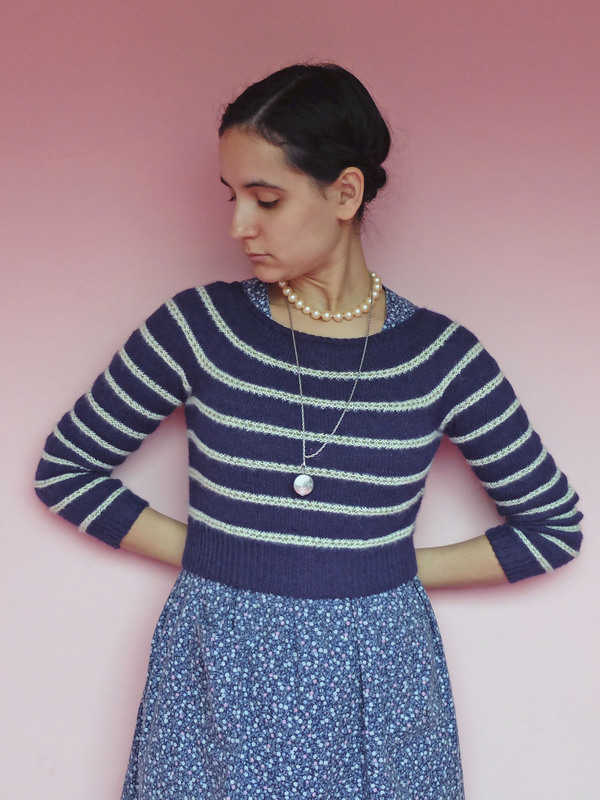 Love this top, envious of those who can knit. Thank you! You should learn to knit, there’s nothing really complicated to it: all it takes is a little patience! Oh this is great! I do love a stripe so much! Yay, stripes! looks lovely, and I think it’ll TOTALLY be worth lengthening it. Funny, I think I’m going to do the opposite and shorten my current project! Ok now, that’s it, I really need to get to lenghtening that sweater!